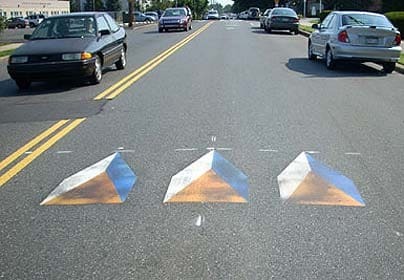 Here’s a real stupid idea for you: virtual speed humps. To be sure, there is something clever about getting drivers to slow down without having to go through the fuss of actually pouring cement. But what you are really doing is training drivers to ignore speed humps. That’s using yer smarts Philly! We were driving to a birthday party. Mrs. Muttrox was in rare form. Me: Those are some nice houses. A good sized yard for this area. Her: Sure, but they’re over a million dollars. Her: Sure, this neighborhood is pricey. Me: I wonder why, it doesn’t seem that great… a million dollars? Her: Well, the ones coming up are around $900,000, so it makes sense. Me: I don’t see the price on the sign. How do you know those are $900,000. Her: I don’t know, but I’m assuming they’re that much. Tonight was big hands all the way. On the third hand, my nut flush lost to a full house on the river. We had a quad 8s, I got a quad 4s, there was another quad 8s. Every other hand was three of a kind or better. Eh, the details are boring. I lost last week, won this week. Good to be the winner again. * Some of my readers know I predicted a comfortable Celtics win. I wish I had documented it here in the blog. It might make up for some of my cursed political predictions. * By comfortable, I meant 20 points or so. Not 39! * Wow. I mean, wow. * Rondo redeemed himself. I haven’t understood why announcers have been saying he was ineffective the last few games. He was playing just or good as bad as ever. Empirically, he didn’t seem any worse, so why was he being pulled out all the time? Last night was his style of playing. One suggestion: shoot with both hands. He shot six one-handed floaters, six missed. Most of those shots he had the time and space to use his other hand. * Sam Cassell may not be The Mole, but I was glad he didn’t play. * PJ Brown is one heck of dirty player. He has a full arsenal of sneaky tricks. He may be on our team, but I still don’t like him. * Has Ray Allen ever looked deadlier? Was there ever a question that any of those three-pointers would miss? * Garnett finally played the game we all wanted to see. Aggressive on both ends of the court. It’s about time they give him low post plays. * Pierce may not have scored a lot, but his defense was impressive as always, plus 10 assists and a couple steals. I loved his halftime “interview” with Michelle Tofoya where he seemed completely confused by her question about effort. It’s the NBA, it’s the finals, this is how you play, duh! If there were any doubts they would take it, his comments about keeping the foot on the gas let you know that more was coming. * Gatorade on the coach? I don’t like it. Don’t like it in the NFL, even worse in the NBA. Gatorade got all over the floor, that should be a technical. * I felt bad for the Lakers. That’s how I know we don’t have a real rivalry. Back in the day I would have loved nothing more than watching those lousy freakin’ Los Angeles losers get buried and heckled. It’s not the same. * Phil Jackson got outcoached. There can be no doubt. In every way his team was not as prepared as the Celtics. * Worst banner of the night: June 17 + Banner 17 = Pierce 34! Um yes… And guess what else? If you take Farmers age and subtract Luke Waltons number you get 17 also. Where is your god now Los Angeles!!! * It’s really too bad the Patriots couldn’t win the Superbowl. That would have been so sweet. Maybe this was the beginning and Boston sports will run the table this year. * Now that the finals are over, I can catch up on my sleep. And start taking care of my daughter. Speaking of kids, the Celtics have some real cute ones, eh? Kendrick Perkins and his little one year old were precious. To paraphrase Paul Pierce and Kevin Garnett: Hell yeeah! Aaarrgggooohhoooo!! Yeah!! Let me hear you!!! Gggrraaaggghhh!! !